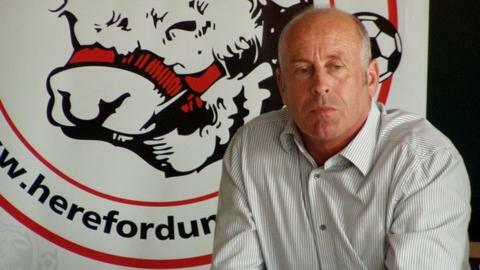 Hereford manager Martin Foyle says that the introduction of the Under-21 Premier League is preventing youngsters from gaining lower league experience. The Blue Square Bet Premier club are among a number of sides to rely on taking young loan signings to bolster their squad. Foyle told BBC Hereford & Worcester: "Where's the development for the boys? "If they're not playing first-team football and they get released at 21, where do they go?" He continued: "That's one thing they don't show - they never show the numbers of Premier League boys who go out of the game. "They get taken on in number. But only two or three are kept on. The other 18 or so go on trial or are trying to get a club elsewhere. "They soon go out of the game. That is a statistic they should probably come out with and show the true figures." Foyle has also lamented the short-term effect of struggling to bring loan players in at Edgar Street. "Football has changed so our recruitment area has gone down," he said. "And those who run that league don't want their players to go out on loan." The former Port Vale and York City manager, a prolific striker in his Football League days with Aldershot, Oxford and Vale, added: "I've spoken to a lot of good friends who are at Premier League clubs. "They're trying to get the Under-21 league up and running. "I've spoken to two or three managers and asked them if I can take a player and they have told me: 'No, they are not going anywhere this season because we want to win the league'. "So there is only a certain network you can now work in when you are trying to bring players to Hereford. "Our recruitment area has gone from around 15% of the Premier League and Football League down to around 10%."